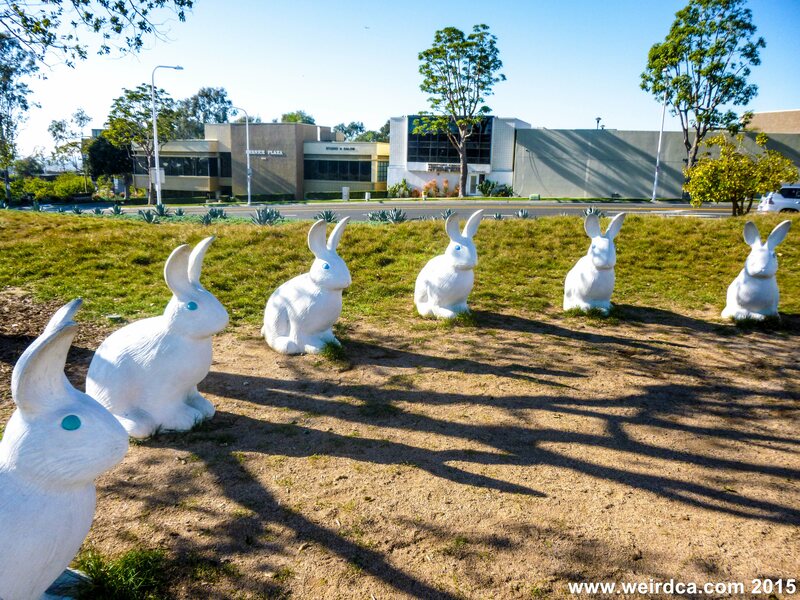 Bunny Henge near the Newport Beach Civic Center consists of 14 concrete bunnies. Tiffany posing with one of the bunnies in Bunny Henge. 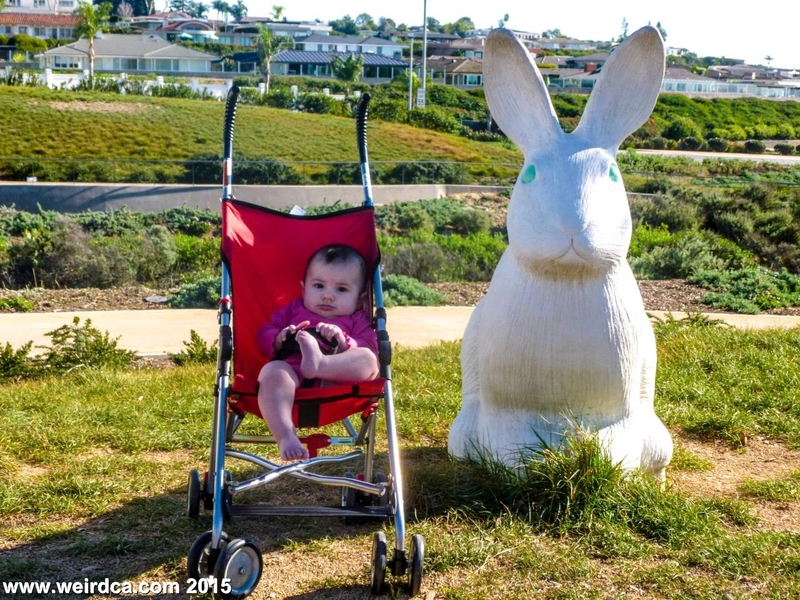 Newport Beach redid their Civic Center a few years ago, and sometime in 2013 the Civic Center Park opened up. 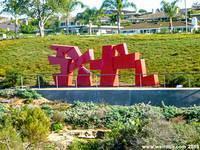 The park is sixteen acres and includes a dog park plus 1.23 miles of walking trails. It is the city's fifth largest park. In addition to the multiple paths, there are even bridges and viewing platforms overlooking part of the park. 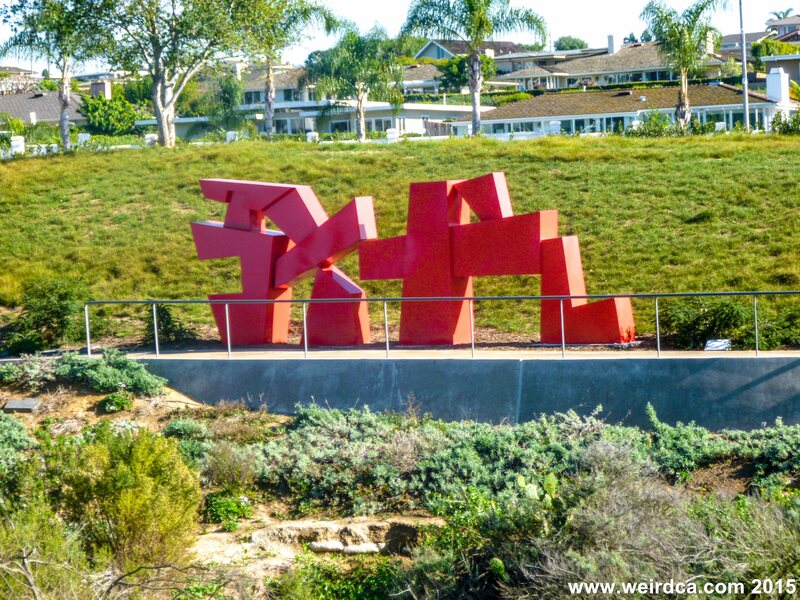 Additionally the park currently has ten interesting sculptures spread around the park, with more potentially coming in the future. But perhaps the most controversial and strange part of the park is actually not considered art, but instead considered something for kids. 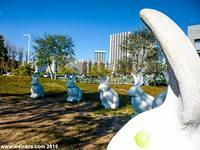 Sixteen large concrete bunnies are located within the park. Fourteen are in the three to four foot range and are situated in a circle facing inward towards each other. 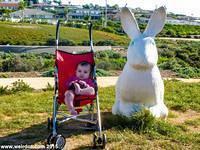 They are designed to encourage children to climb and sit upon them. 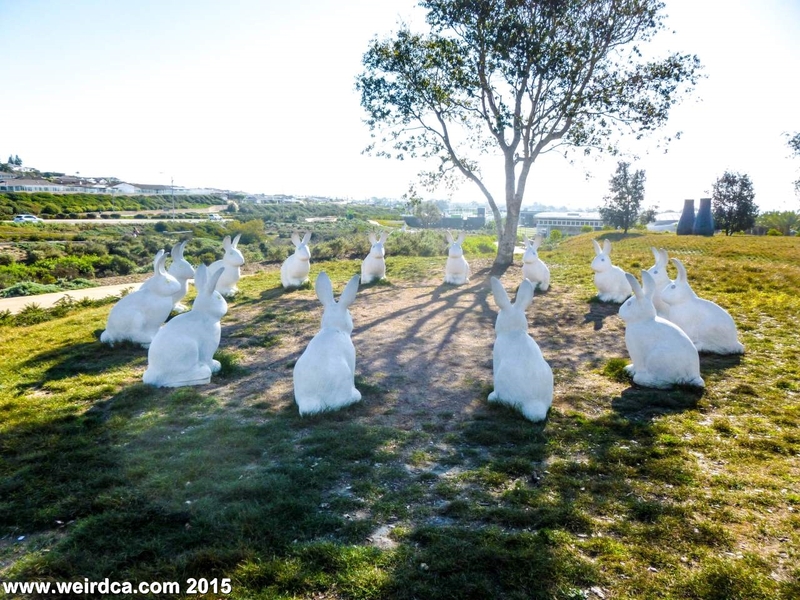 Six of the 14 bunnies that make up Bunny Henge. There are also two eight foot bunnies located in other parts of the park. One can be found east of the library and the other north of the Civic Center entry road at the intersection of some of the trails. 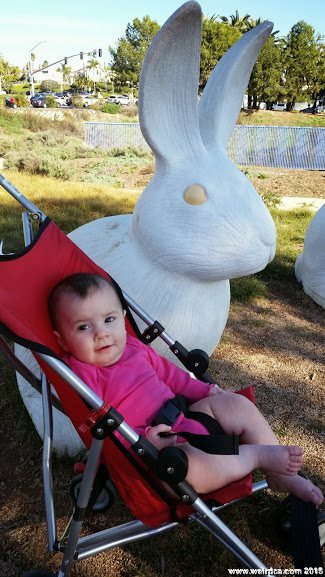 One of two eight foot tall bunnies in the park. 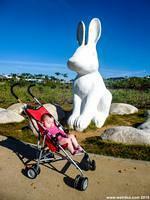 Tiffany with a 8 foot tall bunny. 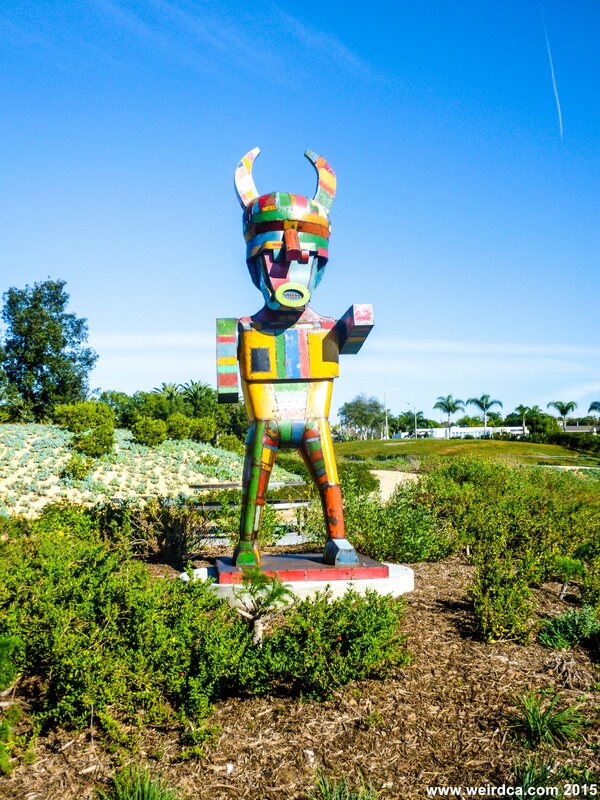 Pretty Boy - one of ten sculptures in the park. The sixteen bunnies are deliberately over sized and according to the Civic Center made whimsical in order to encourage imagination. But some don't appreciate or like the bunnies. The bunnies have taken a lot of heat recently due to their original cost. 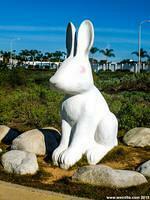 Combined they came in at $221,000, or roughly $13,800 per bunny. Seen as an exorbitant amount by some in Newport Beach, the bunnies have become ammunition for some of the more fiscally conservative politicians in the area, claiming that the bunnies were a complete waste of money. 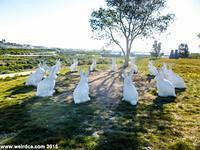 A few of the politicians even unfortunately want to evict the bunnies from the park. So to be on the safe side, you should visit them soon. The bunnies are also dressed in seasonal attire occasionally, receiving heart necklaces for Valentine's Day, green hats for St. Patrick's Day, and even red scarves for winter. Please note that there is little to no shade throughout much of the park, so please take appropriate precautions.